After studying law in Hanover Dr. Eckardt received his doctorate for a thesis on the electronic “Bolero Bill of Lading under German and English Law”. 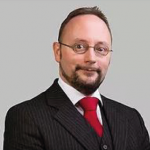 Since being admitted to the bar in 2005 he has worked for Ahlers & Vogel in the field of Maritime and Transport Law and International Trade Law. He became a partner in 2012 and is head of the firm’s Leer office. Apart from handling mandates, he is an editor of the Journal for International Trade Law (Zeitschrift für Internationales Handelsrecht – IHR). He also edits the law journal “Transportrecht”, focusing on transport law. Apart from his publications in national and international journals Dr. Eckardt contributed to the 2nd and 3rd edition of volume 7 [Transport Law, Shipping Law] of the Münchener Kommentar zum Handelsgesetzbuch [the leading commentary on the German Commercial Code]. Dr. Eckardt is a member of the German Association for Transport Law (DGTR), the Association Internationale des Jeunes Avocats (AIJA) and the German Maritime Arbitration Association (GMAA).